With interest rates on the rise, we challenge the accepted wisdom that fixed income stands to lose in this environment and share why we welcome this turn in the cycle. Global bond yields have been rising since 2016, in a trend that many investors have long dreaded. We understand these fears, but feel that they are often misplaced. 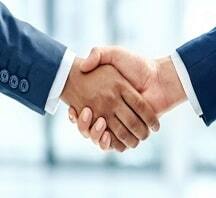 As investors, we should always think about fixed income in a total return context. Bonds deliver two forms of return: income and capital (Figure 1). In our observation, too little focus is placed on the former, while the latter garners a disproportionate amount of negative press. As interest rates rise, it is critical that bond investors have a deep understanding of the drivers of total return, and maintain their focus on those factors that truly matter. For an asset class called "fixed income", there is surprisingly little focus on income as a source of return. Over the medium term, income provides the majority of the total return that is generated by bonds, as illustrated by Charts 1 and 2. 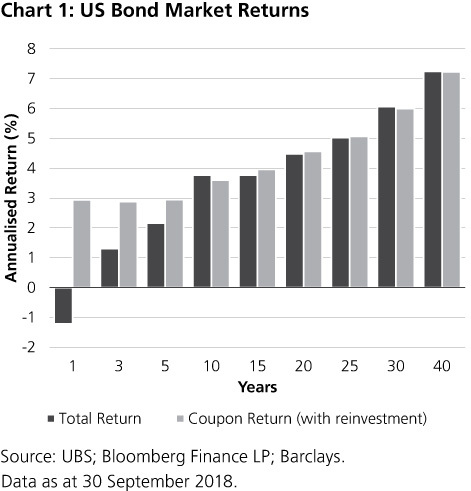 In the short run, coupon income makes a positive contribution towards total return, and absorbs the negative price impacts from higher bond yields. Over the longer run, total returns converge upon income returns, as price volatility dissipates. 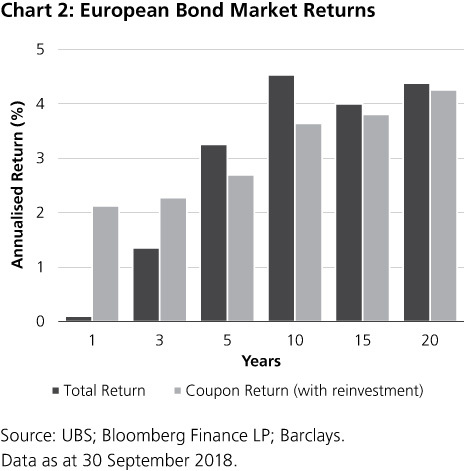 As such, the income generated from a bond portfolio is critical for its total return; rising interest rates provide a supportive tail-wind for future income returns. This focus on income is not to dismiss investor concerns about unrealised losses from bonds, in the short run. It is well known that bond yields and prices have an inverse mathematical relationship: as yields rise, prices fall. Fears over a bond market correction often imply an instantaneous, parallel shift higher in yields. In practice, this is highly unlikely to occur. Such talk also disregards the cushioning effect that income provides against adverse price developments, as shown above. Many caution about the death of a decades-old bull market in bond prices: we find no evidence to support this accepted market wisdom. As global yields fell from 9% to 2%, so did the coupon rates that bonds carry. Rather than price returns being over-inflated, income returns were lowered sequentially. As rates rise, bond prices will adjust to equalise expected returns between outstanding bonds and prevailing market yields. Over time, bond prices remain anchored by par value, as older securities mature and new debt is issued. 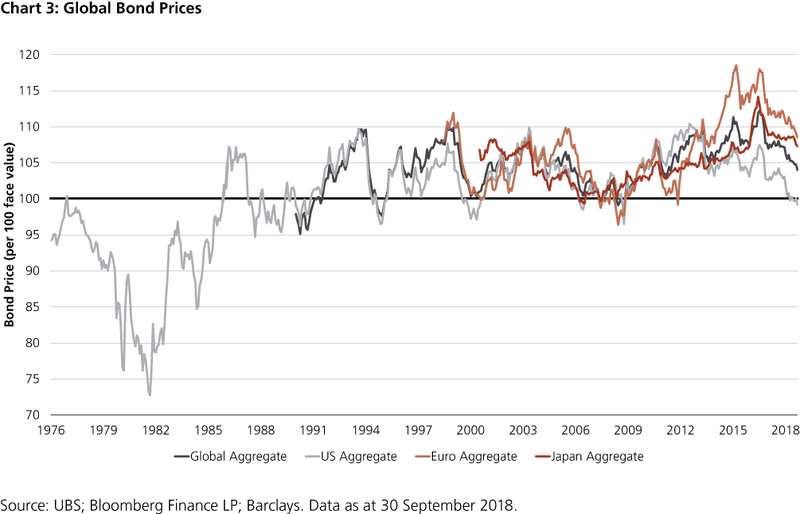 There is no decades-old bubble in bond prices that is waiting to be popped by rising interest rates; actually, prices peaked several years ago (Chart 3). A rising interest rate environment may challenge investors' nerves, delivering a short-run trade-off between declining capital returns and increasing income returns. However, over time, income effects will dominate, boosting total returns. Partnering with an active investment manager, like UBS, who has demonstrated expertise in managing both income and capital returns, will also help bond investors to ride out the coming storm. Disclaimer: This article is intended to provide general information only and has been prepared by UBS Asset Management (Australia) Ltd (ABN 31 003 146 290) (AFS Licence No. 222605) without taking into account any particular person’s objectives, financial situation or needs. Any opinions expressed in this material are those of UBS Asset Management (Australia) Ltd, a member of the Asset Management division of UBS Group AG, and are subject to change without notice. This material does not constitute an offer or recommendation to buy or sell any securities or financial products, or to conclude any legal act of any kind whatsoever. Neither UBS Group AG nor any of its affiliates, directors, employees or agents accepts any liability for any loss or damage arising out of the use of all or any part of this material.